Just as Jeremiah Goodbye is set to meet his fate in the electric chair, a tornado tears down the prison walls, giving him a second chance at life. Upon his escape, he realizes he has entered a world overtaken by the Dust Bowl. During his journey home to Nowhere, Oklahoma, he accidentally rescues a young boy named Peter Cotton. When the Black Sunday storm hits, the residents of Nowhere begin to let years of hardship bury them under the weight of all that dust. Unlikely heroes, Jeremiah and Peter Cotton, try to protect the townspeople from themselves. 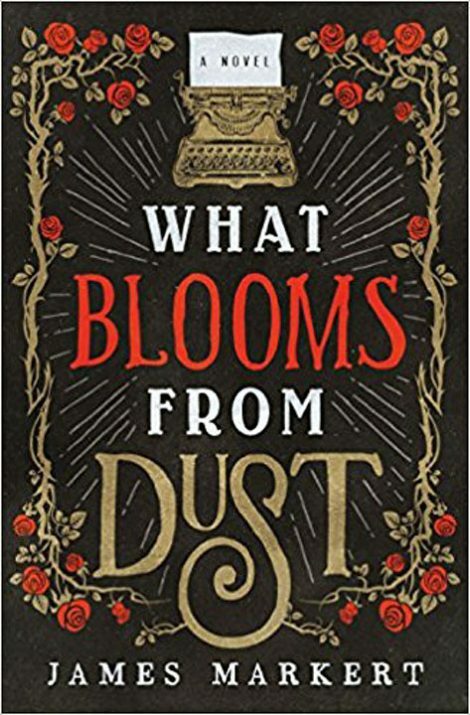 Filled with mystery and magic, What Blooms from Dust is the story of finding hope in the midst of darkness and discovering the beauty of unexpected kindness. 1. There are some flawed characters in this story. Discuss how redemption plays a role in the novel, specifically with Jeremiah and Josiah Goodbye. 2. The Dust Bowl was a terribly bleak time in our country’s history. I’ve always been a half- full kind of guy. Think of some instances in the story where a character shows optimism and hope when all seems lost. 3. Discuss the aspect of fate in regard to Jeremiah flipping that coin. Discuss fate vs chance with some examples throughout the book. 4. As twins, in what ways are Jeremiah and Josiah Goodbye similar? In what ways are they different? How does their relationship go from broken to whole again? 5. 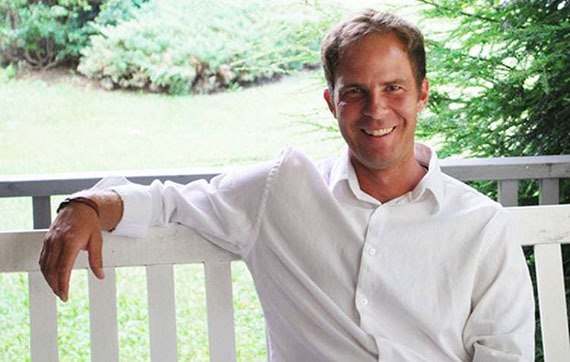 Peter Cotton is an observer who doesn’t verbally say much, although his actions and smile speak volumes. After he gets the paper and ribbon for the typewriter, how is his written word ultimately transformative? 6. In the story, Peter’s letters aren’t just letters. Discuss the power of the written word. 7. While writing this story, the phrase “killing it with kindness” popped into my head. The kindness in Nowhere ultimately trumps meanness. Can kindness really be contagious? 8. I always try to have my characters transform throughout the course of a novel. Which character changes the most from the beginning of the novel to the end? How and why? 9. Give examples of how forgiveness plays a role in the novel. 10. In many of my books, beauty can be found beneath the dirt and grime of life. Only in fiction can red roses bloom from dust. In the novel, what seeds, planted now or in the past, helped bring this miracle about? 11. The Bentley Hotel is more than just a hotel in this story. What role does the hotel play in this town? 12. In many cases, you can’t judge a book by its cover. Discuss how Jeremiah Goodbye was often misunderstood. The train ride out west was free. Paid in full by the brand-new state of Oklahoma in hopes of encouraging settlement in the land once occupied by bison and Indians. Wilmington Goodbye knew the truth of it. They’d been killed off—the bison, for sure, and too many of the Indians to count. Those that survived the cowboys and Rangers got squeezed together into reservations. The state had earmarked the rest of the land for homesteading. And no place looked more promising than Majestic, Oklahoma. Wilmington studied the pamphlet for the tenth time in the last hour—glorious pictures of elegant buildings, paved roads edged by flowers, show houses where finely dressed couples wandered about. And that fountain in the town center looked majestic in itself. With each choof of the train, Wilmington and his pregnant wife, Amanda, inched closer to becoming landowners, with fresh soil to plow up and a fortune to be made in a state just one year old. He folded the pamphlet and slid it back into his suit pocket. He teased the corners of his mustache and straightened the fresh rose he’d pinned to his lapel that morning. Amanda was bathed in sunlight nearly the color of her hair. She smiled. They’d repeated the slogan often enough, as had the rest of the men and women on the train. He’d met half of them already and was proud to call them future neighbors. Citizens of Majestic. He had a notion to look at the pamphlet again but resisted. Instead he watched his wife as miles of grassland flashed in the background. The doctor back east said the air would be better for her out here, away from the city pollution. Her breathing had already become less labored. The swell of her belly pressed tight against her blue dress. She has to have an entire brood in there. She’d laughed the idea off at first, but had recently admitted she felt more than one baby kicking around. Tall prairie grass swayed alongside the speeding train. Miles of velvety blades, moving like something Wilmington couldn’t quite put a finger on. Ocean waves, maybe. They had to be getting close. But where were the buildings? Where were the roads? And that town center? Shouldn’t they see it over the horizon? Two minutes later the train slowed and then screeched to a halt. “Why are we stopping?” asked a man Wilmington now knew as Orion Bentley, a fancy gentleman in a suit as sharp as his wit and a bowler hat straight from the newest catalogues. They’d befriended each other minutes after boarding the train and had engaged in meaningful, optimistic dialogue for much of the trip. “Must be something on the tracks,” said Wilmington. Everyone crowded near the windows. A man in a brown suit and matching hat stood in the shin- high grass holding a clipboard and pen. The doors opened. People hesitated, but then, beckoned by the man’s hand gesture, they exited the train. There were twenty- two of them in all, dressed to the nines in their Sunday best—long, colorful dresses, pressed suits, and polished shoes for the special occasion. Wilmington stepped in front of the group and faced the suited man. “What’s the meaning of this? We’re supposed to be escorted to Majestic, Oklahoma.” He removed the pamphlet from his coat, as most of the others had already done. “See? Right here.” Only then did he notice the rippling white flags spaced out across the prairie land, staked like the homesteading of virgin land instead of one already expertly developed. The newcomers eyed one another. Tears mingled with the wind. Husbands held their wives as prairie grass whipped to a frenzy around ankles and knees. All those white flags. Miles upon miles of desolation cut by a blazing sun. The orange sky looked to be bleeding in places, swirling just along the horizon. Grass as far as the eye could see. The two men locked eyes. Amanda looked from one to the other and knew.